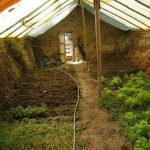 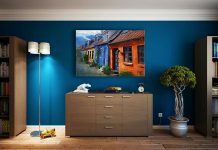 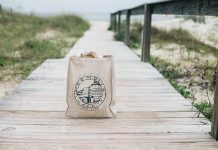 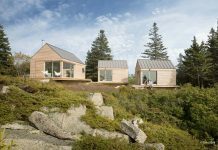 There continues to be a very real change in the property and real estate market globally, and as new and existing home owners tighten their belts to compensate for increasing costs, interest rates and other economic realities, the option of tiny house living continues to offer very attractive and well designed opportunties. 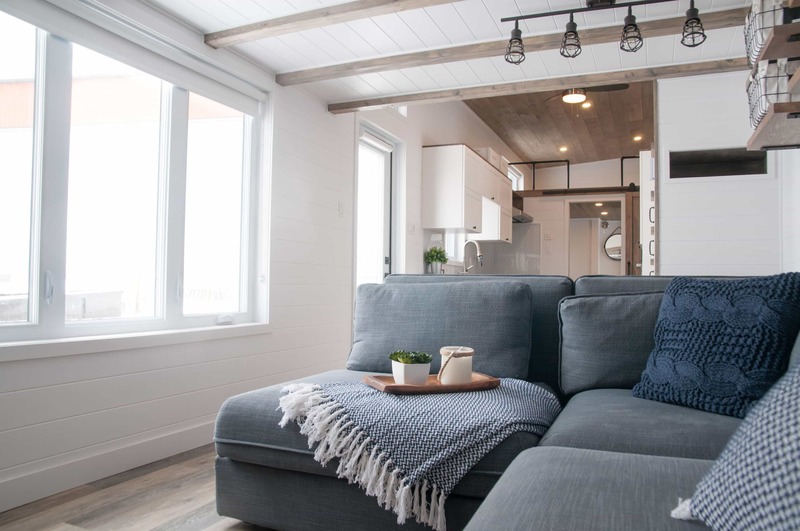 It must be said, that tiny house living is definitely not for everyone, though companies like Minimaliste in Quebec, Canada, have taken the tiny home concept to a point where even the most ardent opponent of the idea could easily be swayed. 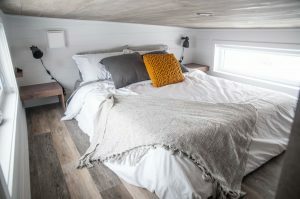 In particular, their recently designed and released Ébène tiny home has brilliantly captured the essence of the relationship between ‘form and function’, and their clear eye for great design, and a commitment to high quality components, means they have created a true beauty of a home with the Ébène Tiny House. 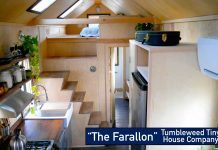 This beautiful tiny house is larger than most, and includes some important elements that really make it feel like a small modern home, condo or apartment. This small home is built on a larger platform than the average tiny home model. 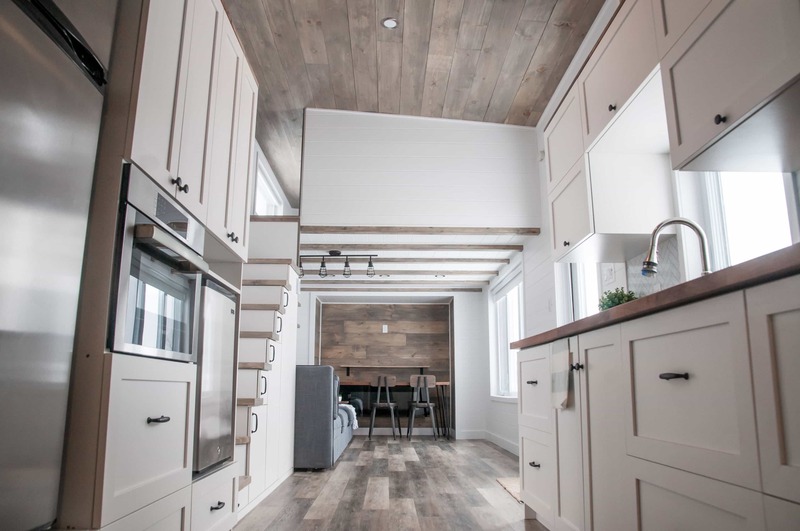 At 10 feet wide by 34 feet long, this beautiful tiny house is large enough to work some serious design ‘magic’, and the people at Minimaliste have definitely done just that! 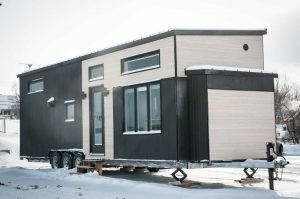 Being so wide however, means that transporting this home will require some arrangements, as in most regions, anything wider than 8 feet will require specific permits when moving the home. That said, this additional width has permitted the designers to ‘go-to-town’ with their design skills, and the final result is a beautiful tiny house with a full 485 ft2 of living space! This additional space means that the home feels far more spacious and open than most tiny houses, and the use of large windows makes the home feel open and ‘airy’, with plenty of light to brighten up their great design. 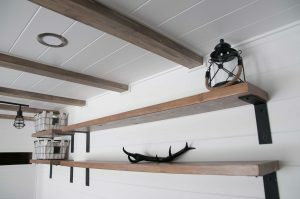 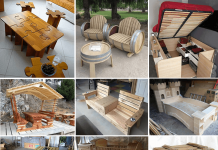 other natural wood components of the home. 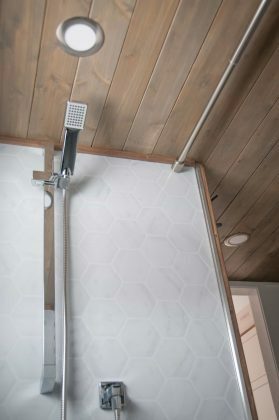 The added textural contrasts increase the very tangible and unique modern design that stands out in any environment, and gives this home some serious design credibility. 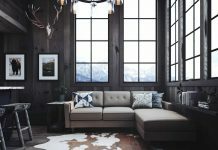 The engineering team at Minimaliste also recognized the impact that sunlight may have on their color choices, and cleverly opted to ensure the shade of black they chose would be better able to age with time in the sun. 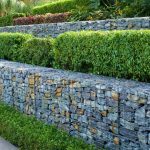 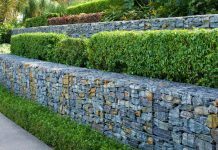 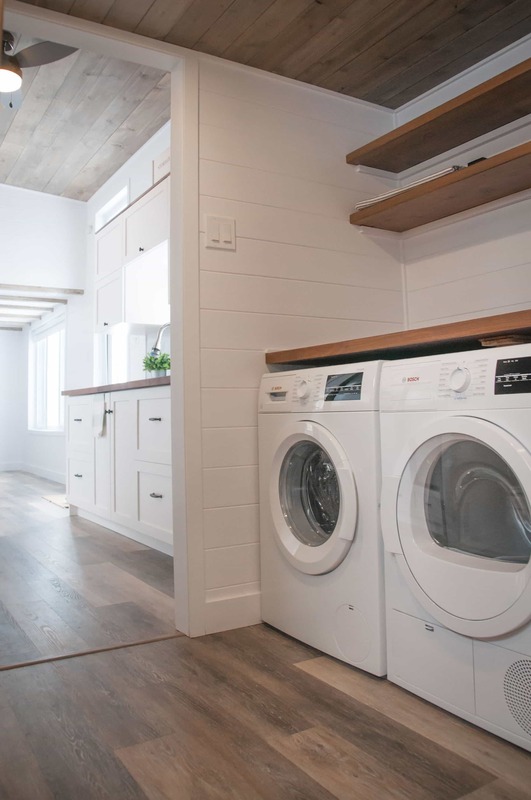 These small, but knowledgeable, design choices that have been made not only stand out from a design perspective, but also add credibility to, and confidence in, the engineers and designers for taking the time to be particularly meticulous in their choice of materials. 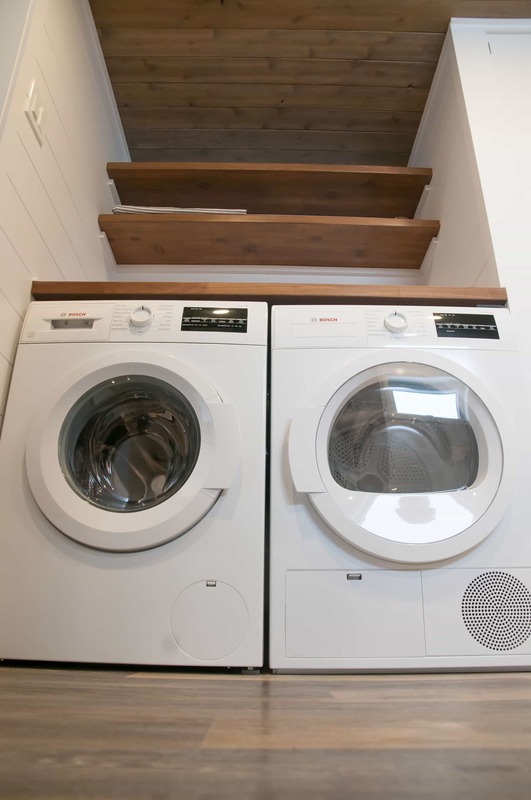 amenities of living in a more ‘standard’ home. 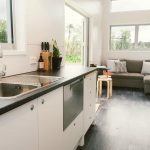 It was important to them that the home had an open feel, and didn’t create the ‘cave’ effect that can all too often be the case with many tiny house constructions. With the Ébène they succeeded in abundance, and this truly beautiful tiny home sparkles as an excellent example of a design philosophy, and engineering ethos that is done very well. The first Ébène that has been made is built with a 50 Amp system, capable of connecting to all grid services. 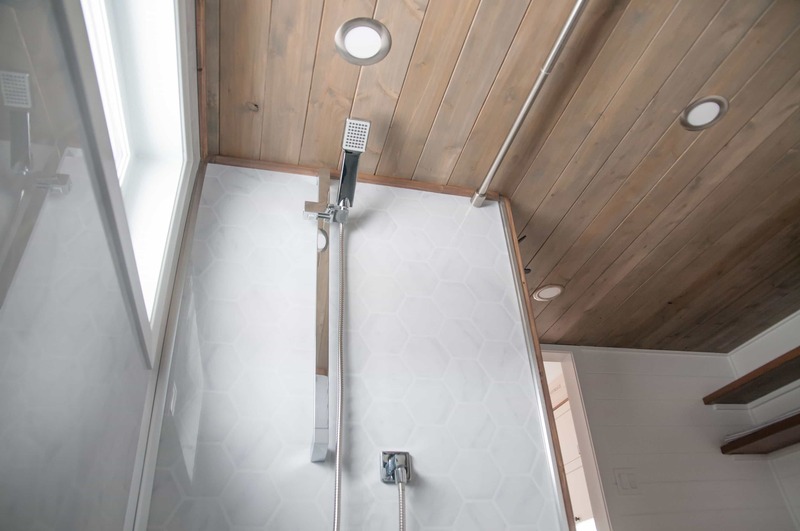 While the option always exists to have a fully solar package installed, the Minimaliste team’s philosophy is to make use of any services that are already available, unless it is your specific desire to run your home off-grid. 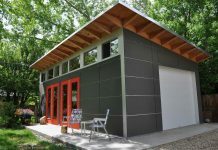 The option to run a 12V system, and make this home fully off-grid exists, though their initial model is designed for grid connected electrical services. 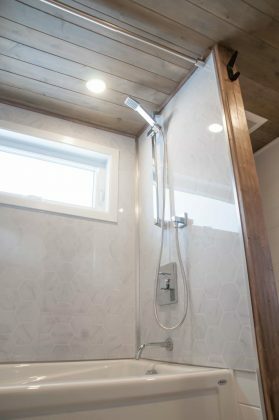 In this instance, with a 50 Amp system in place, they Ébène also includes floor heating system, which in the cold climate this home was built for, makes an important impact to the ambient comfort of the home, without the need to run forced air devices at all times; furthermore, the choice of an electric floor heating system, in deference to a propane or gas powered system, means that maintenance on the system can be reduced, which helps keeps the overall cost of upkeep for the home lower. 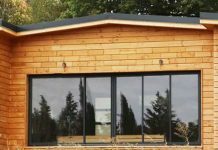 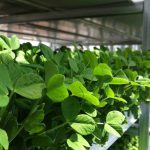 within the design, to enhance their usability, meaning they are located practically and with a chefs mind at the forefront of the design process. 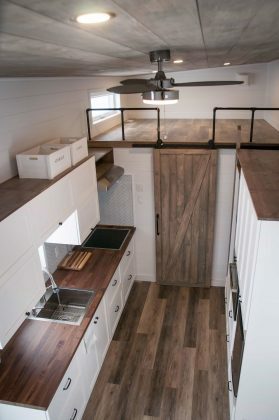 There is a plethora of cupboards and storage, and the kitchen even includes a pantry for storing all manner of items. 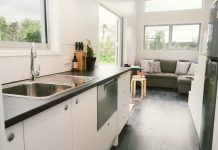 Given the additional width of this great looking home, the kitchen is large enough for more than one person to work comfortably. 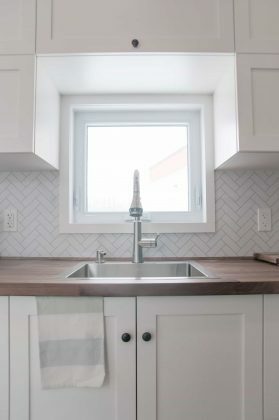 We all know that when guests are around, everyone gravitates to the kitchen, so this amazing design is well suited to accommodate such occasions. 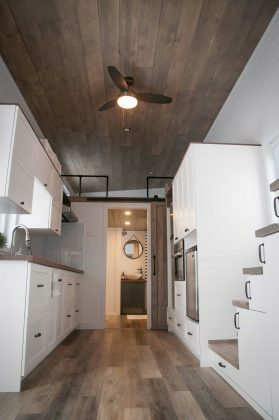 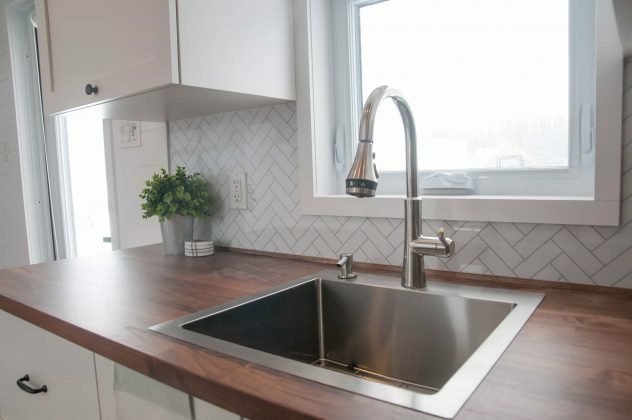 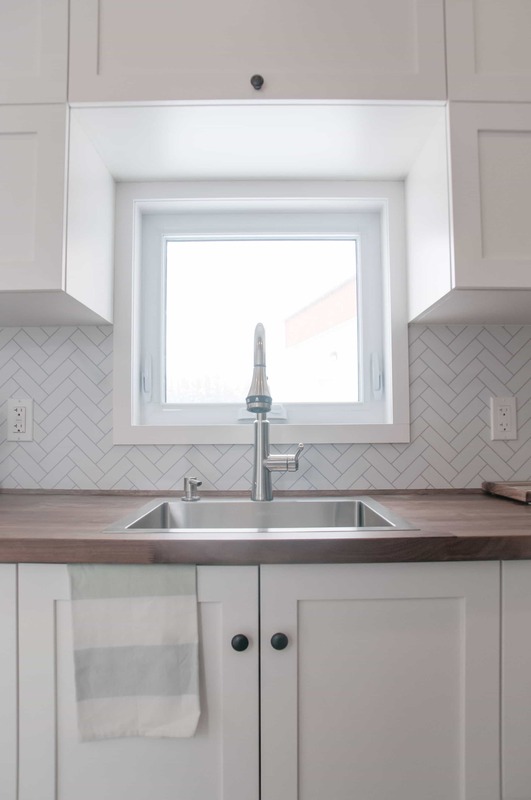 With ample cabinetry, a wider shared space, full appliances and deep sink, there is nothing missing from this well thought out, and excellently designed beautiful tiny house kitchen! 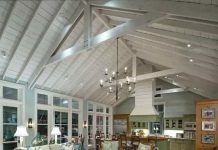 friends over for dinner and drinks, this relatively large space will definitely suit your needs. 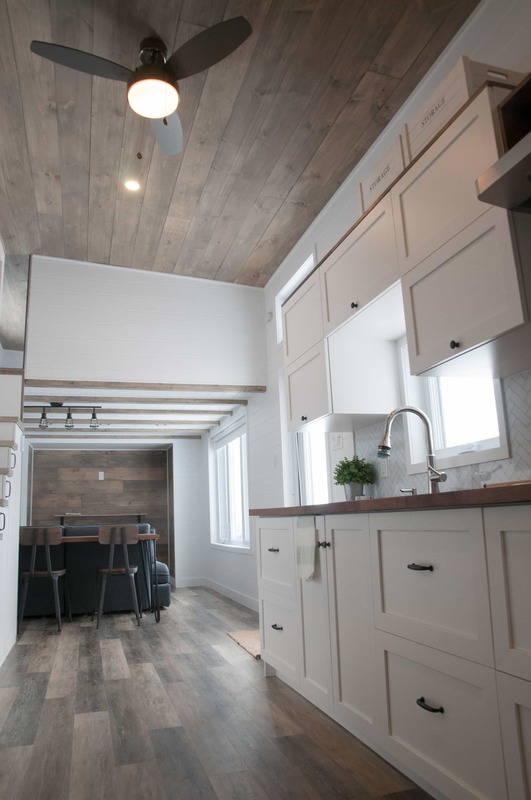 There is a built-in bar style eating nook as well, which serves a practical purpose, while also creating an excellent design element to the space that adds to the experience of living in the Ébène. Access to the main sleeping loft is via a well designed staircase, which is so well designed into the home, that it seems to blend into the character of the home without any distraction. The team have cleverly included additional storage in all the small spaces, nooks and crannies within the house, to maximize all the space available. The loft itself is spacious, with plenty of ventilation and light to create a very comfortable and relaxed environment, which will definitely ensure that when it is time to get some rest, you will do so with a smile. There is nothing missing from the Ébène, and that include the features of the bathroom and washing areas. 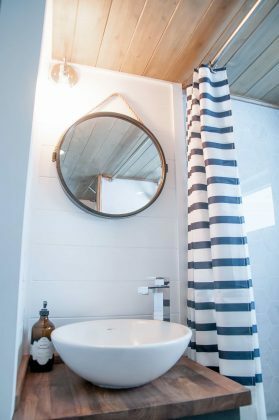 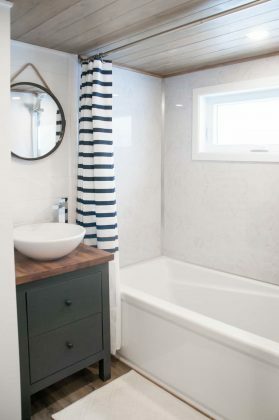 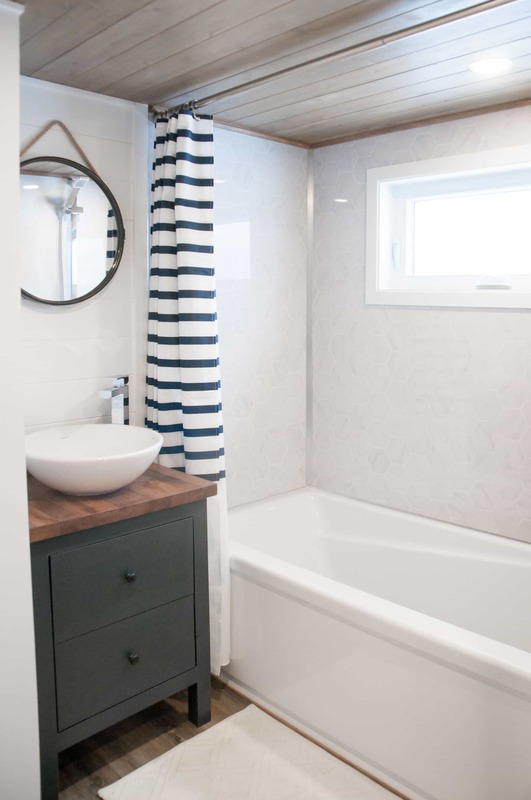 Like any standard home, this beautiful tiny home includes a full sized bath tub/shower, vanity and storage. In fact, the bathroom in this home is larger than some normal apartment dwellings. Included in the design, is space for both a washer and dryer, in addition to storage for towels, or any items you may feel to place inside. 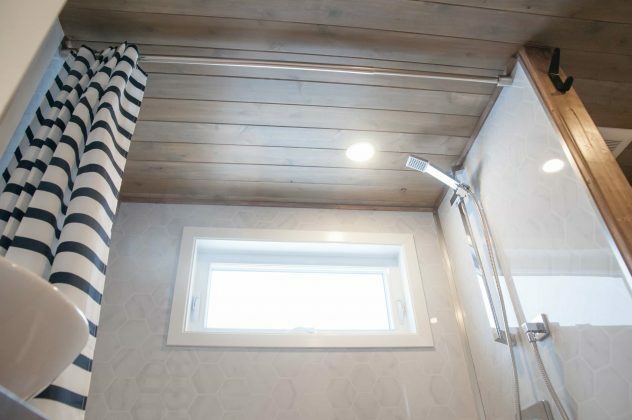 The ceiling fan in the bathroom ensures there is ample air-flow, reducing moisture related issues, and ensuring a comfortable environment at all times. 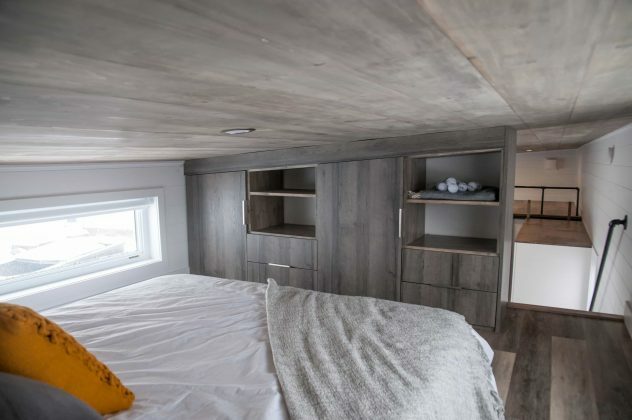 The Ébène, which we previously noted is considered a park model tiny house on wheels, is a complete 485 ft2 living home that is sure to impress. 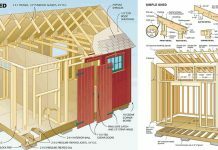 The original model, fully completed is priced at $98,860 USD ($130,000 CND). This is a more expensive model of tiny home, given its much larger size, and the inclusion of various impressive features, such as in-floor heating, and a full sized bathtub. 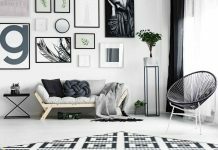 In general terms, the team at Minimalist suggest that the expected outlay for the Ébène home can range from $57,000 to $122,000 USD ($75,000 to $160,000 CND), and this depends largely on the features and upgrades you choose for this beautiful tiny home. This is, without a doubt, a beautiful tiny house. 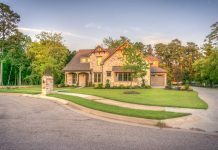 It is larger than most available today, and while there may be some additional requirements when moving the home, the full featured element of this home makes it a very attractive option. 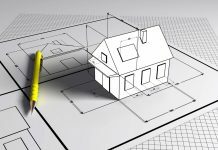 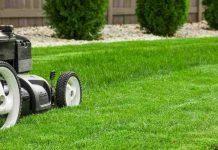 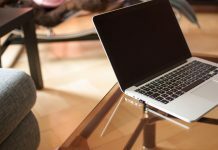 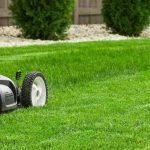 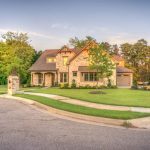 Of course, the price reflects the additional size of this home, though exactly how you kit it out will determine exactly what you will pay in the end. 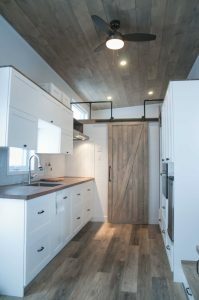 With excellent refinements, and a very well thought out design, this tiny house from Minimaliste stands out. 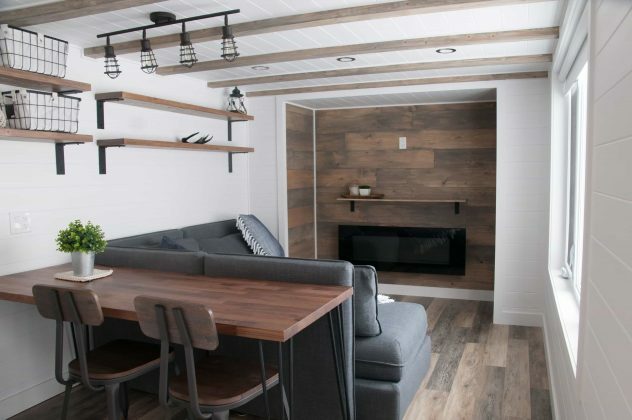 We love this beautiful tiny house, and hope you’ve enjoyed the details, as much as we have. 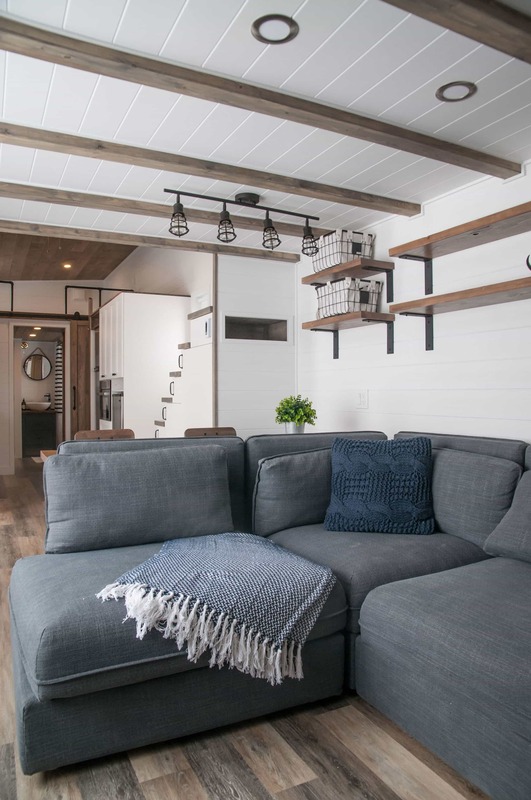 If you want to see more details on some amazing small homes, check out the recent article on the tiny house with removable trailer from Build Tiny – it is another innovative twist on the tiny house idea, and well worth checking out.